It's incredible how maintaining a number of hummingbird feeders in suitable montane habitat can electrify a roadside cafe. We stopped at several such spots in our travels in Costa Rica on our trip in February and March. 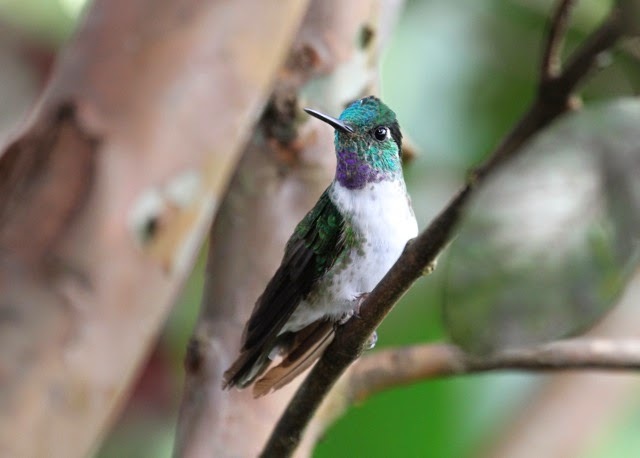 Unassuming little cafes serving typical local food, and abuzz with hummingbirds. We only actually ate at one of the cafe's. Usually, we only had time to stop and ogle the birds. We'd leave a donation to help the proprietors. It was really quite an elegant system. 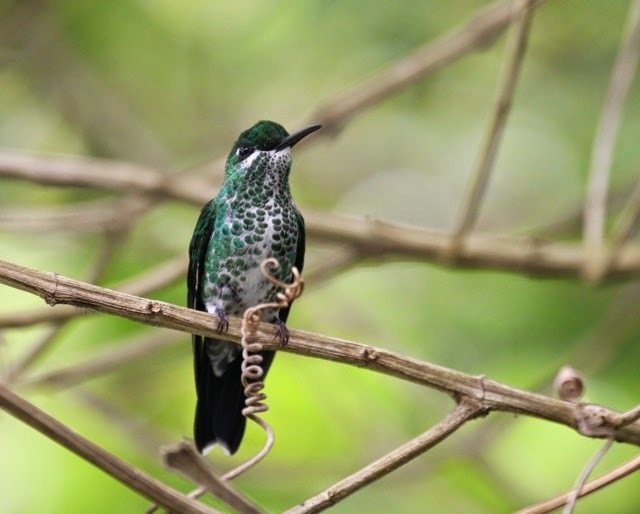 These photos were taken at Mirador Cinchona, famous for its hard to find hummingbirds. female's throat and underside KILL me. I love this little gal with her tendril. So natty in her polka-dot pajamas. 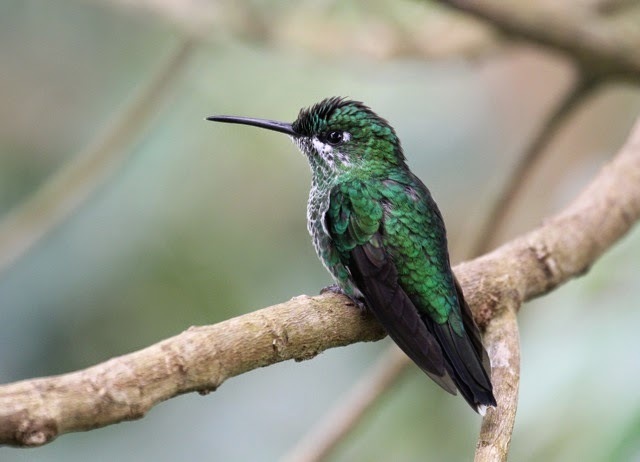 The tiny coppery-headed emerald was very difficult to get, as it zipped in very quickly, flashing its white-patched copper tail, and back out before I could focus. But I followed it to the perch where it was resting. Absolutely exquisite. Even if it has a confusing name, because the tail's a whole lot copperier than the head. I loved its tiny slightly decurved bill. 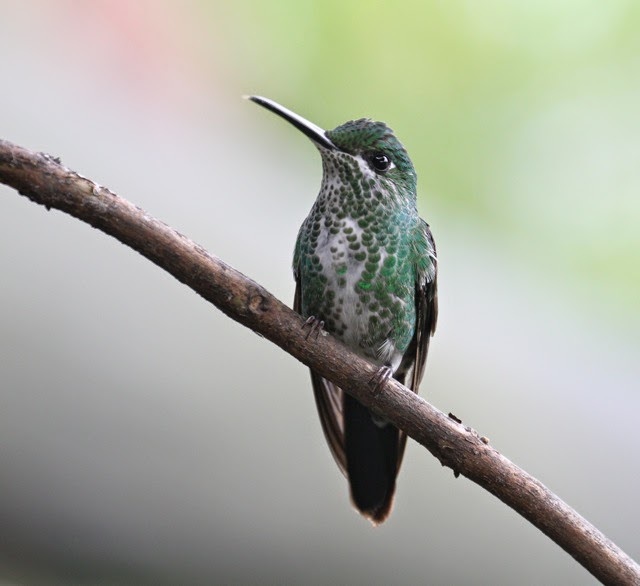 When there's a cloud of hummingbirds buzzing, you can find this bird by its tiny size and the flashing white on the sides of its tail. Here you can see a bit of the white in its tail, which is really impressive as it flares the tail in flight. 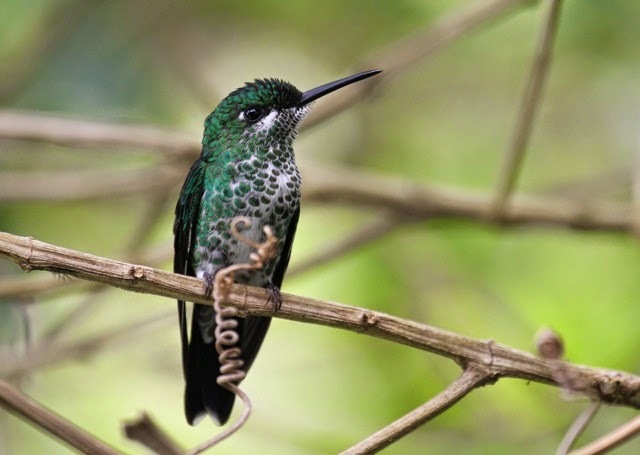 Coppery-headed emerald is a Costa Rican endemic, meaning it's found nowhere else in the world. All hail Mirador Cinchona!! May your feeders stay full and never get moldy! May happy birders flock to your veranda and leave many dollars! May your emeralds multiply and be fruitful! 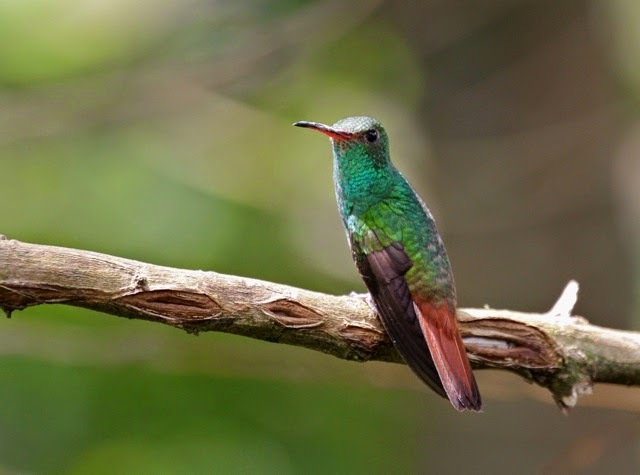 Though the field marks are superficially similar, the coppery headed emerald is not to be confused with the much larger and more abundant rufous-tailed hummingbird, which we saw in almost all habitats across Costa Rica. Common it may be, but a good look at it reveals an exquisite bird. This was the first time I realized this Amazilia had an aquamarine gorget. Whoo. One of my tenets as a birdwatcher is never to scorn the common birds. I've been known to go into raptures over a great tailed grackle, right Mario? 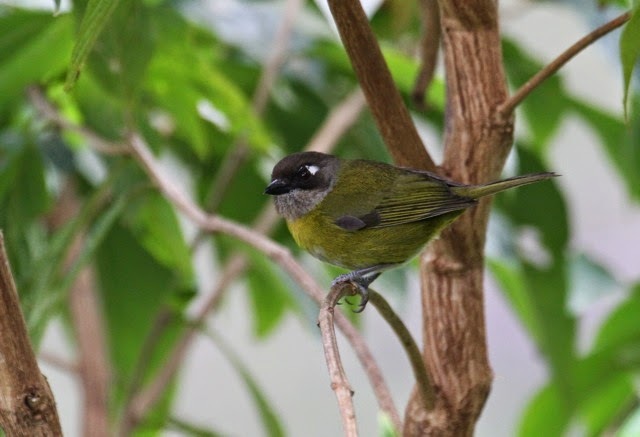 Speaking of common birds, here's a common bush tanager waiting to visit the feeders. 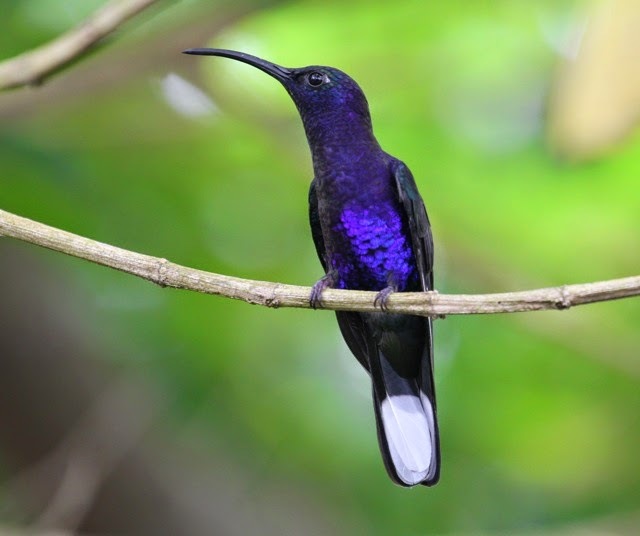 It's a bird that travels in mixed-species flocks, all foraging together for fruit and insects, whatever they may find. Violet sabrewings were the stars of the show, but they've had their own blogpost already. So we'll just put one in for eye candy. Mmmm. Still wondering why I never saw a female. 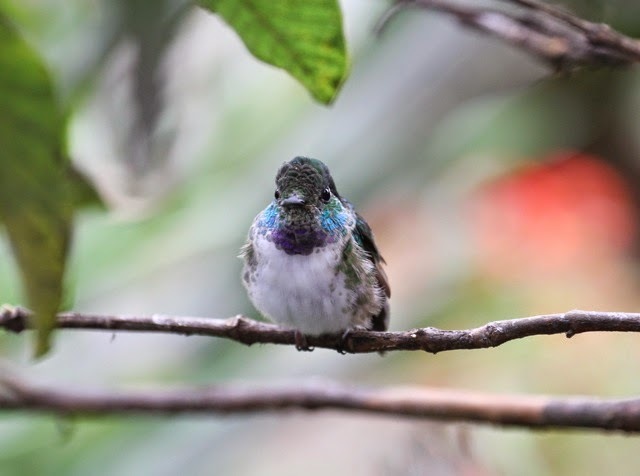 I was determined to get some decent photos of a teeny-tiny white-bellied mountaingem who was hiding deep in a shrub beneath one of the feeders. To do this I had to hunker down under one of the cafe's tables and point my lens down through the underbrush. He had the most ridiculous combo of colors on his head and throat, and they changed with each turn of his head. Holy cow. That violet! That shimmering emerald, that turquoise!! Loved that birdie. Well worth the contortions and groaning to get down and deal with it, to get those photos. 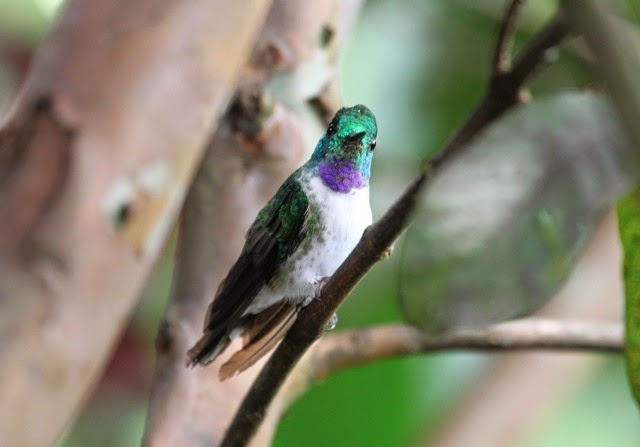 This was the only white-bellied mountaingem we saw on the whole trip. For several participants, who didn't get to see all those colors, the camera captured it. I loved being able to show people who might not have wanted to crawl under a table all the breathtaking things I was seeing. 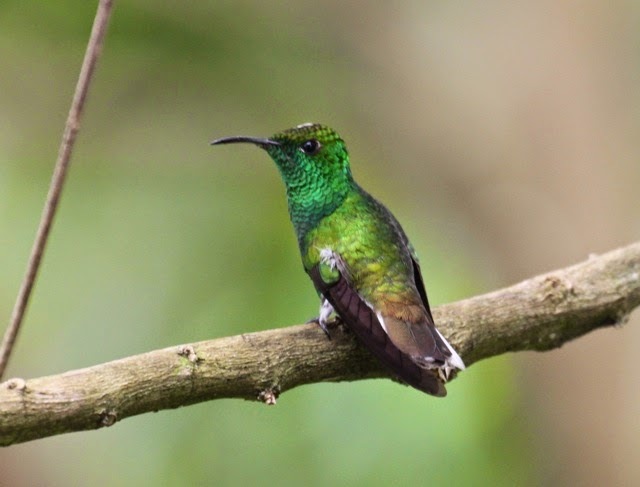 More green-crowned brilliants...this one the male. They always make me think of dragons. They're long, lean and mean-looking. I have a penchant for the females, though. They could win a cute face contest, if there were one for hummingbirds. 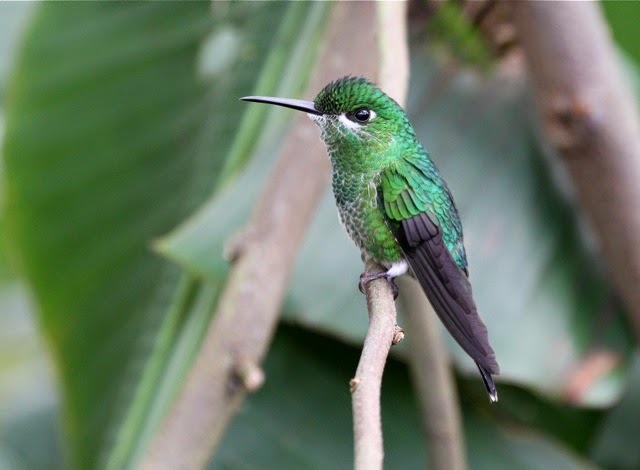 I would like to hold a hummingbird pageant. We could have a flying skills showcase, a swimsuit competition. And then there's the Cute Face competition. I'd put money on Miss Green-crowned Brilliant. 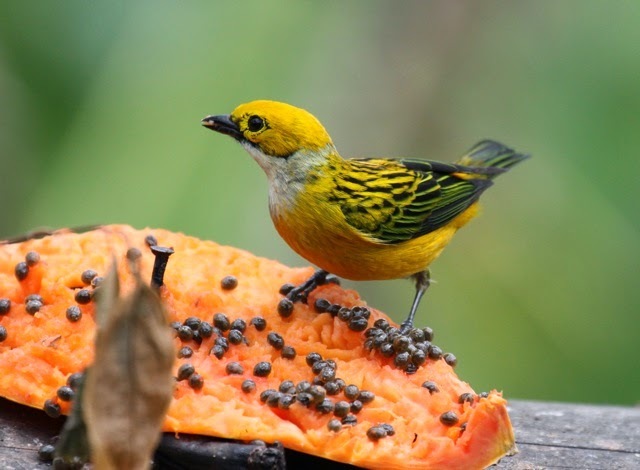 At the Big Bird feeder, a silver-throated tanager feasted on papaya. 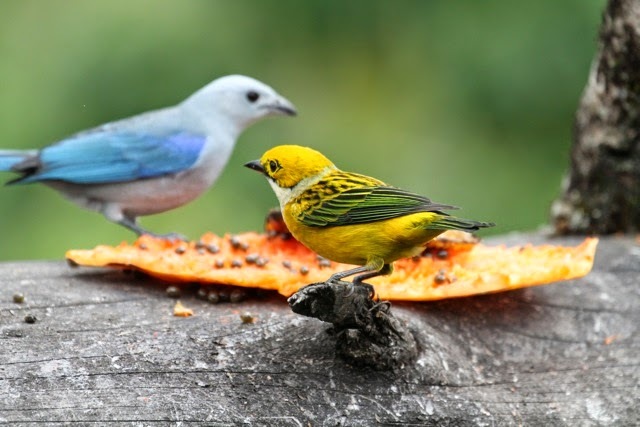 And was joined by a blue-gray tanager. We feasted our eyes on them. What natty birds!! Tough being upstaged by hummingbirds. 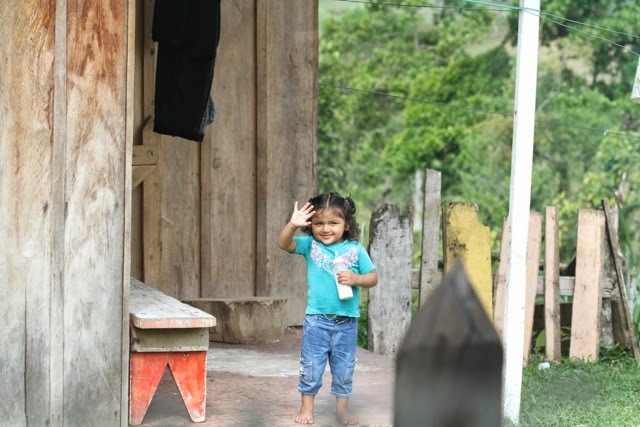 As we left, we passed a tiny Tica, holding her bottle and waving. She got an AWWWW from the entire bus. 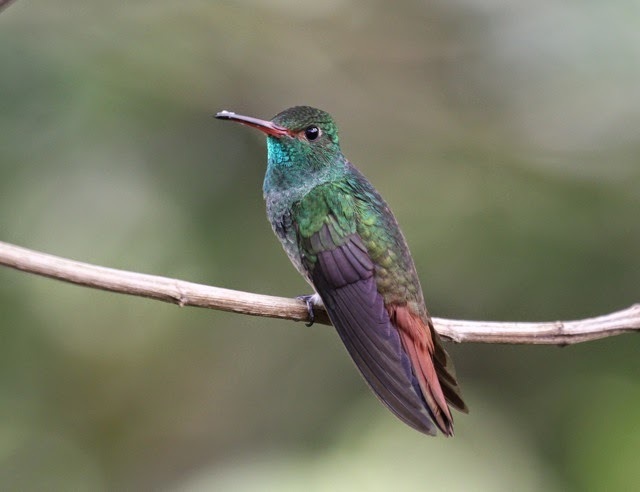 Julie, your photos of these amazing and colorful birds, and their stories (and yours of crawling under the table! ), have made my morning. Thank you! 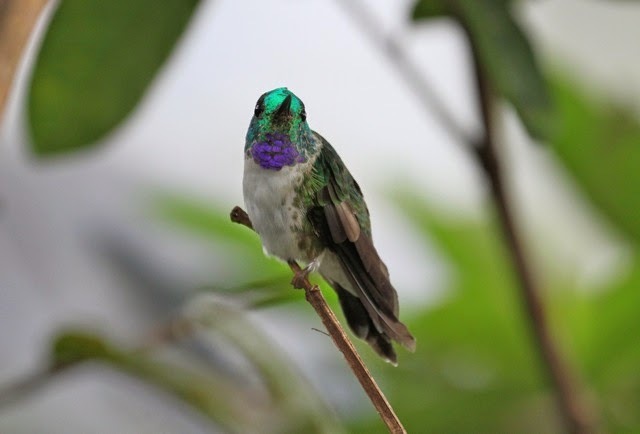 A hummingbird pageant - love this! You certainly captured all the entrants. Astonishing. 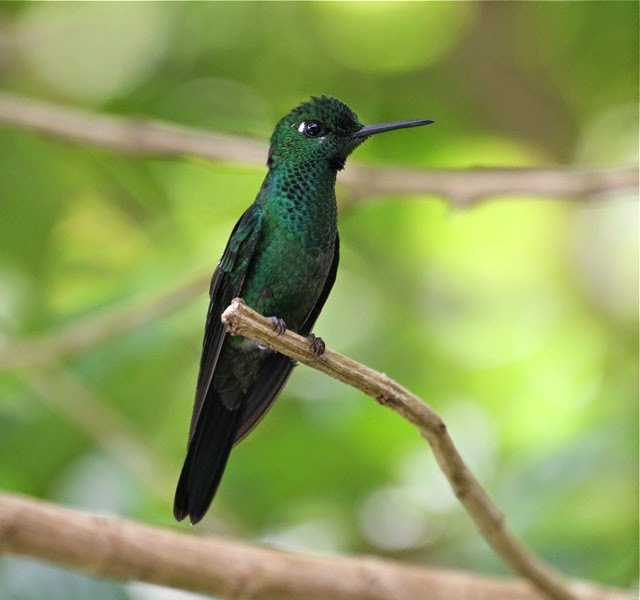 My lovely but not pageant-worthy Broad-tailed hummingbirds have discovered the yet unplanted cache of Black-and-blue salvia on the back porch. They're not waiting for me to get them planted! Great post! Wow! What glorious birds and gorgeous photos. Thanks! 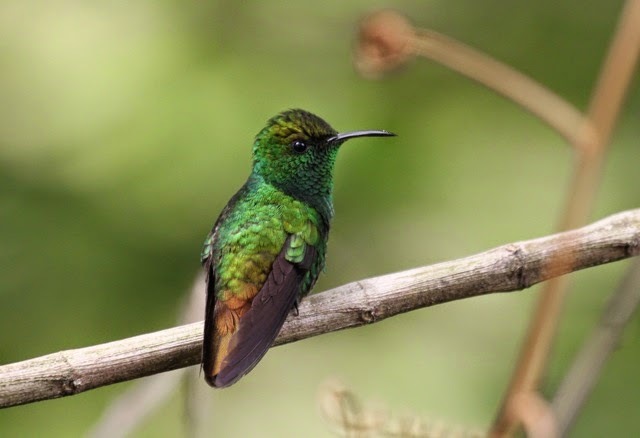 I would have hundreds of photos of those bright green hummingbirds if I had been on this trip. I'd go back to Costa Rica with you again in a heartbeat! It was the best trip of my life, so many new sightings, and such wonderful travel mates. Great time had by all! I especially enjoyed feeding the capuchins and macaws! Take care and I hope to reconnect with the group, sometime. Thanks for the great memories.